This Jigsaw Puzzle is dedicated to all the kids who want to become Astronauts. Solving this Puzzle will help you to increase your visual skills. It will also help you to sharp your brain. One Jigsaw Piece is taken from Nasa Puzzle Image of Space Shuttle launch. 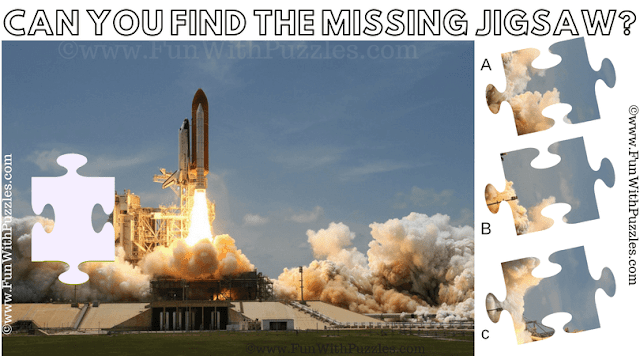 Can you correctly match this missing Jigsaw Piece in the given puzzle image and solve this Nasa Jigsaw Puzzle? Answer of this "Nasa Jigsaw Puzzle", can be viewed by clicking on answer button. Please do give your best try before looking at the answer. Yes, this is correct answer for this Naga Jigsaw Puzzle.